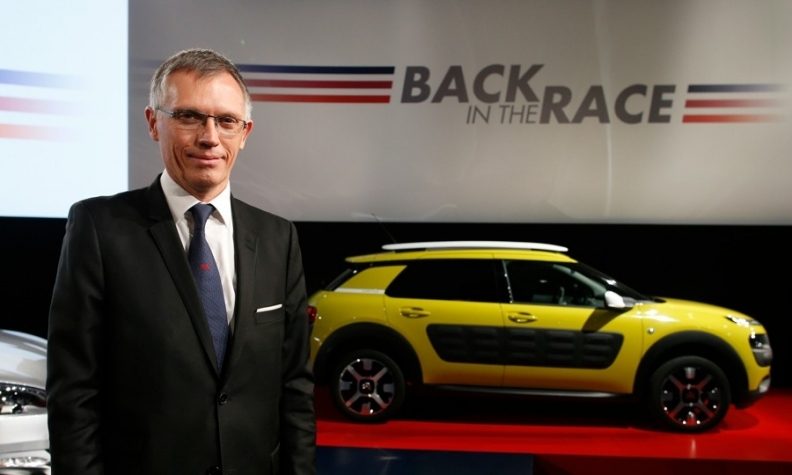 PSA CEO Carlos Tavares, pictured with a Citroen C4 Cactus, has delivered a turnaround at PSA. FRANKFURT (Bloomberg) -- They said this day would never arrive. PSA/Peugeot-Citroen's 5 percent recurring operating margin in 2015 seemed like an improbability just a few years ago. The carmaker lost more than 8 billion euros ($8.8 billion) between 2012 and 2014, according to Bloomberg data, was almost given up for dead and had to be rescued by the sale of stakes to France's government and China's Dongfeng Motor. Yet PSA has delivered a level of profitability that's dazzling by the modest standards of Europe's mass-market automakers. Carlos Tavares, an ambitious former Renault executive, took over at PSA less than two years ago and set the bar low. PSA was targeting a 2 percent operating margin by 2018 (roughly in line with its historical average) and a 5 percent margin sometime before 2023. Tavares has delivered, and then some. A plant closure, pay freeze and thousands of job cuts -- all started under Tavares's predecessor -- have boosted productivity. Savings in production and procurement contributed 40 percent of operating profit gains last year. Simply put, PSA has cut fixed costs and is spending less on purchasing, thereby lowering its break-even point. The company has also found savings in selling and administrative expenses. It's unfashionable to attribute a carmaker's transformation to the fact that it sells cars customers want to buy. But PSA is doing that too. Sales of the quirky Citroen C4 Cactus (which looks like it has chocolate bars stuck to its sides) almost doubled last year. Tavares may yet regret over-achieving so quickly. Investors have a quirky preference for slow but consistent profit improvement (as opposed to a sudden profit jump followed by a flattening). PSA had quite a bit of help last year from the strong pound, which boosts the value of UK sales. With Brexit fears weighing on the currency that doesn't look like it will be maintained. In addition, emission compliance costs will probably rise after the Volkswagen scandal. PSA's Asia exposure -- China and Southeast Asia are about a quarter of sales -- could also become a bigger drag. And the European market's recovery isn't guaranteed either: PSA expects it to increase just 2 percent in 2016 and in China by 5 percent. Finally, Tavares seems determined to turn the historic DS brand, beloved by French presidents, into a premium carmaker. That helps boost profit per vehicle but will need lots of investment if it hopes to keep pace with the German brands. Sales of DS cars fell 13 percent last year but Tavares says his priority is margin, not volume. Amid broader market turmoil, PSA shares have given up much of last year's gains but they still price in a fair bit of optimism, perhaps reflecting hopes that it will be involved in industry consolidation. At 8.1 times forward earnings, pricing looks expensive compared to compatriot Renault, on 6.5 times. PSA margins are superior but it doesn't plan to start paying a dividend until the end of the new financial year. Renault has a 3 percent yield. Still, credit where it's due, Tavares has dragged an impressive performance out of a former basket case. Investors have high expectations for the next act.